Memory Loss Clock is designed for memory loss/dementia old people. Memory Loss Clock is aimed at helping people living with dementia by simply and clearly displaying the time of day as morning, afternoon, evening or night.People living with dementia can lose the ability to recognise what the time is and even whether it is day or night.This can cause many challenges for them and for their primary carers.By using day clock, it can reduce the challe. 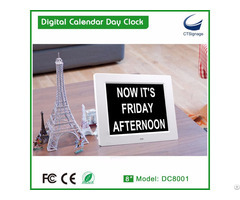 The aim of the Memory Loss Clock is to help people with dementia to be able to link the time of day to their daily routine.The Digital Calendar Day Clock clear and simple display of 'Now it is Monday Morning"is proved to be helpful for people with dementia or Alzheimer. 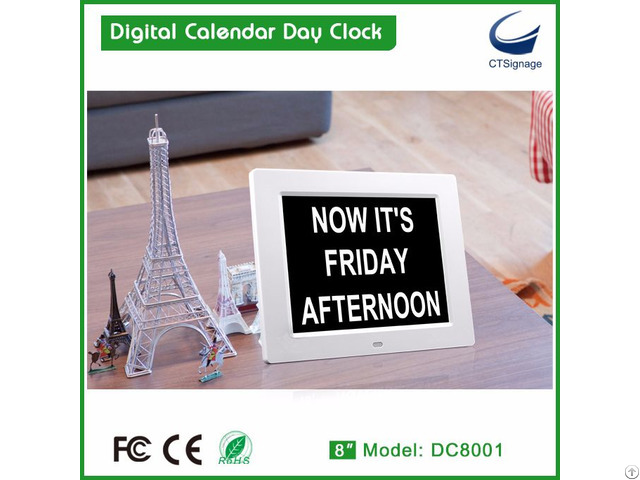 Posted By: CTSignage Technology, Co., Ltd.
Business Description: Ctsignage specialized in video brochure/digital photo frames/ advertising players/ android tables in China for many years, and have OEM/ODM these products for Walmart,philip for many years with powerful product support and high quality delivery.